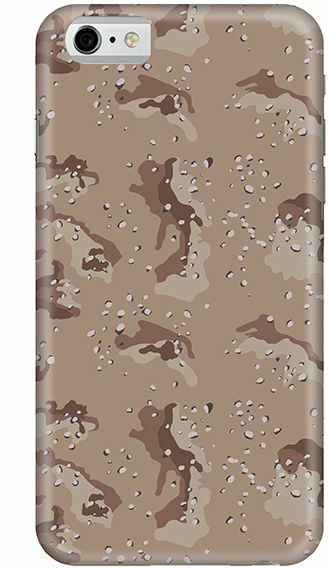 Stylizedd Apple iPhone 6 Premium Slim Snap case cover Gloss Finish - Desert Storm Camo I6-S-75 The Stylizedd Snap Case is constructed from the finest & light Amorphous Polymer, which is actually a very strong plastic (that’s apparently used in outer space). The case is only 2.5mm slim and impeccably shows off the slim profile of your device. The impact-resistant outer shell protects your device from scratch, drops and dust. Our state-of-art technology ensures that your design covers the entire case (even the sides) and will be permanently embedded; unlike in other cases that use thermal transfers.The Snap is a slim fitting one-piece clip-on case. Perfect for keeping the smooth lines in your skinny jeans. We know how important that is! • Slim form factor, durable & light weight • Minimal impact on overall device size• Allows full access to all device ports• Permanent, super-bright & edge-to-edge colors embedded directly onto the caseThe screen designs/artworks are intended as a guide only and should not be regarded as absolute final. All colors, size and alignment you see on your monitors are approximations of final output and could vary slightly on actual product.